Sailors on board two Portsmouth-based Royal Navy warships have sent their mums special Mother's Day messages. 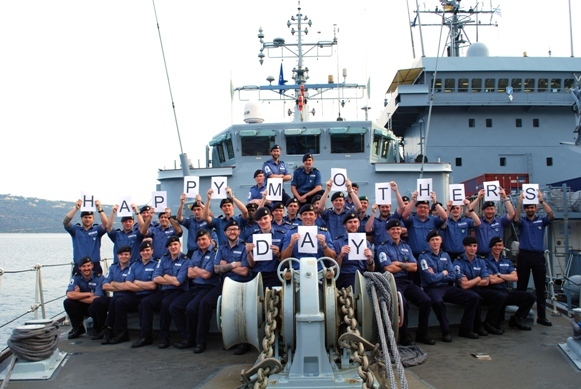 The crew of Type 45 destroyer HMS Dauntless have spelled out 'MUM' and a kiss on the deck, while sailors on minehunter HMS Brocklesby posed for a photo with the message 'Happy Mother's Day'. From the Antarctic to the Caribbean, Afghanistan to the Falklands, phonecalls will be made and in-boxes will be filling up with messages of love from deployed men and women. HMS Brocklesby will be spending Mother's Day in the Mediterranean deployed as part of the Standing NATO Mine Countermeasures Group. Her role is to search the Mediterranean conducting exercises that deal with any potential modern-day mine threat, and dealing with any historic ordnance left in the water from the Second World War. "Being away from home for a long time is just a part of our job - but that doesn't mean we don't think about our families and friends at home every single day. "Mother's Day is an opportunity for us to send a message home telling our mums, wives, sisters and partners just how much we love, and miss them, while we are away." Deployed in the waters off the UK is Type 45 destroyer, HMS Dauntless, whose crew members came together to spell out "MUM" on her flightdeck and then sealed the message with a kiss. Following a port visit to her affiliated city, Newcastle, she will continue north to Scotland where her company will spend the weekend preparing for Exercise Joint Warrior - Europe's largest naval exercise involving several countries navies and nearly 13,000 personnel. But let's not forget the many mothers in the Armed Forces who are serving away from their families this Mother's Day. Deployed in the South Atlantic, HMS Portland is providing reassurance to British interests in the region. Onboard this Devonport based frigate is Plymouth mum-of-two, Petty Officer Gemma Flowers. "Being away at this time of year is difficult, and it really makes you think about what we miss out on while we're away. I miss my children terribly, but sometimes it's the simple things like missing a parent's evening, a doctor's appointment or a school play that can be most upsetting. But I know that my boys understand that their mother and father have to work, and that means that every now and then one of us has to go to sea. "My husband is an amazing father and I know the boys are having a great time with him, he is most definitely the 'fun' parent, so I know I don't have to worry about them."